To announce the start of principal photography on the Untitled Han Solo movie, Disney and Lucasfilm have released a fantastic set photo showing Alden Ehrenreich and Donald Glover in the cockpit of the Millenium Falcon for the very first time, albeit not in their costumes as the young Han Solo and Lando Calrissian, respectively. 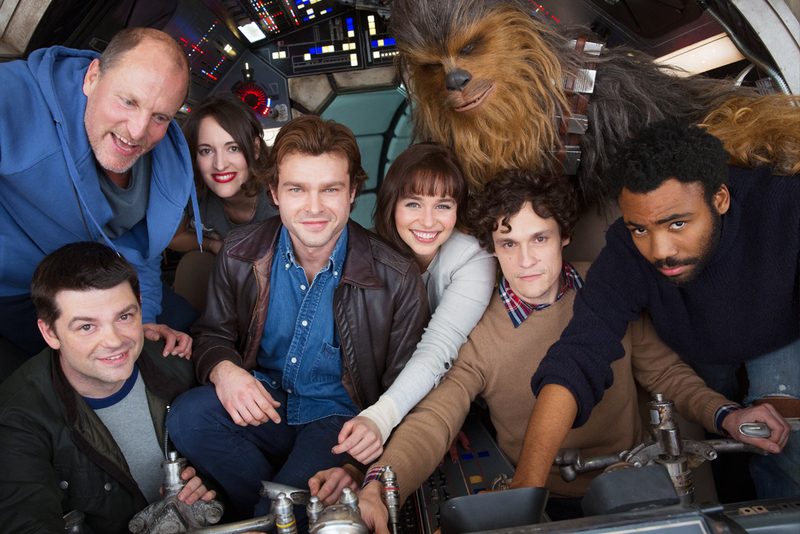 The photo includes Emila Clarke and Phoebe Waller-Bridge, whose characters are currently unknown, and also gives us our first confirmation that Woody Harrelson has joined the cast of the prequel movie, supposedly as Han’s mentor. And, what would a Millenium Falcon photo be without Chewbacca, with Joona Suotamo taking over the role from Peter Mayhew. Thandie Newton, who was recently rumored to be in talks to join the movie, was not pictured. While the title of the movie was not revealed, the release did include a premiere date of May 25, 2018, bucking the trend of new Star Wars movies opening in December.